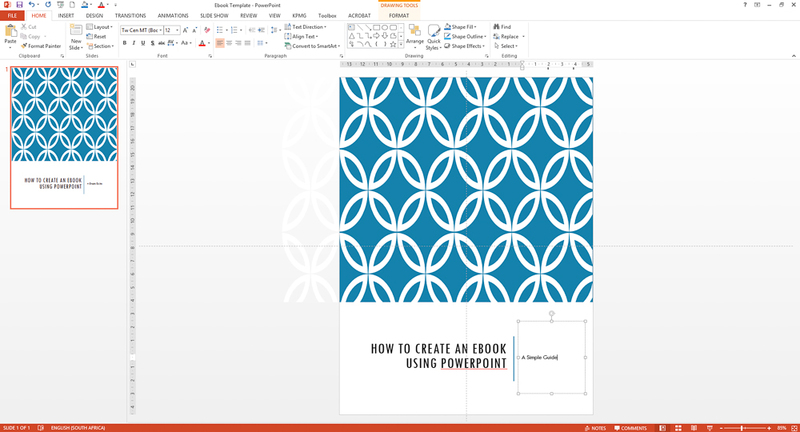 This post is part 5 of the How To Create A Collaborative Ebook series. To learn more, you can start with Part 1: How To Create A Collaborative E-Book For Easy Fundraising . 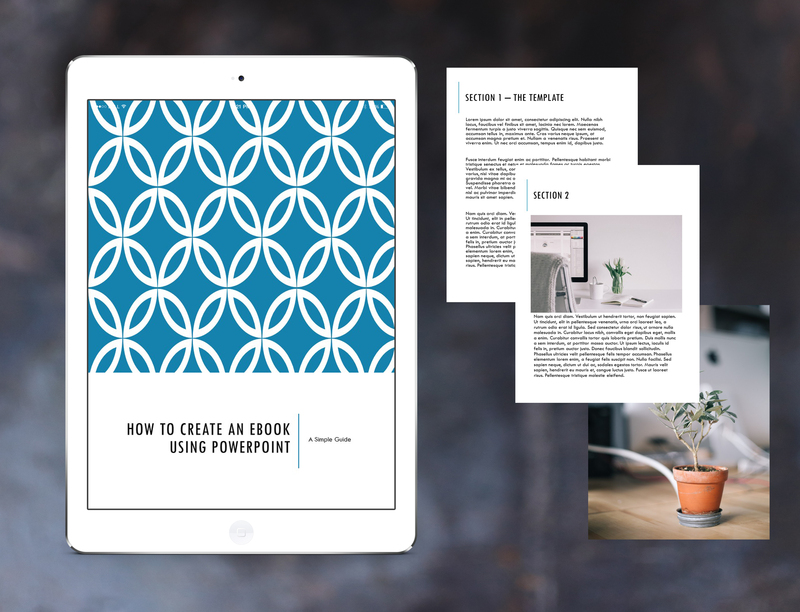 Creating an ebook PDF may seem like quite a complicated process, but it is actually much easier than you think! If you’re feeling stuck as to how to get started, this post will guide you through it. When designing an ebook, the most work happens upfront – before you even start adding any words into your book. Setting up the layout, deciding on the design, selecting fonts and colours etc – this will take a bit of time. But it is worth investing the time upfront and setting up your template, because then it is simply a case of copying over your text, inserting your images, adding some finishing touches, and you are done. 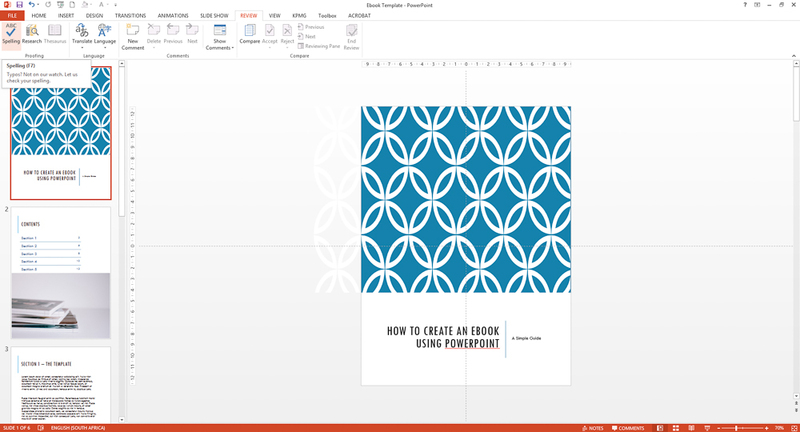 Follow along as I take you through the steps of creating an ebook from scratch. 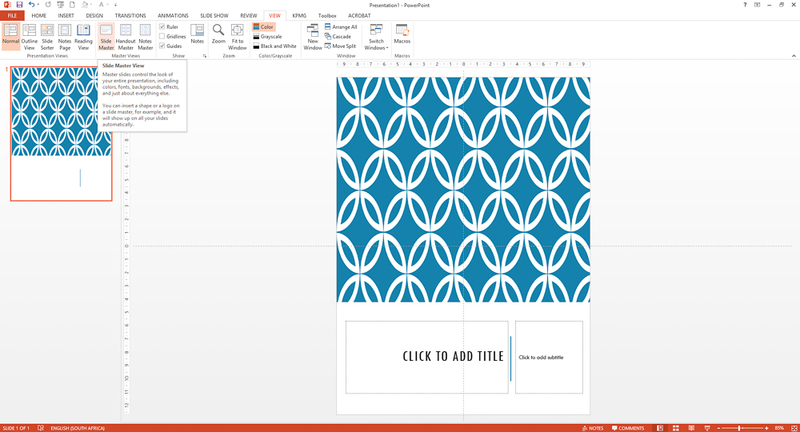 Open a blank PowerPoint document – it doesn’t matter just yet what the slide size is. 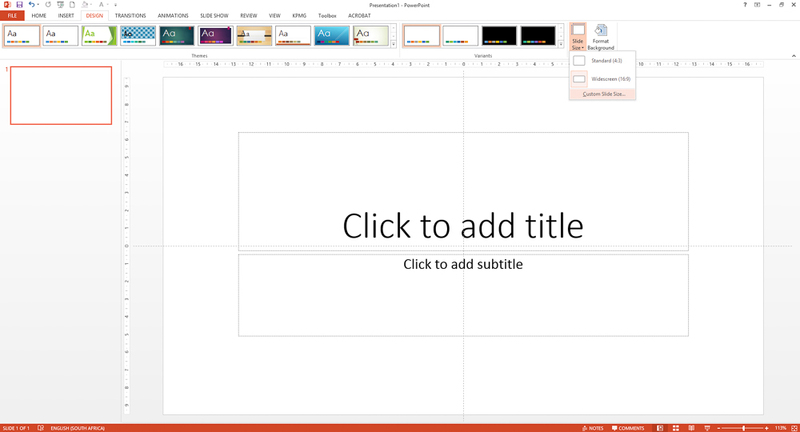 The PowerPoint menu is made up of tabs and ribbons. The labels across the top are called tabs. 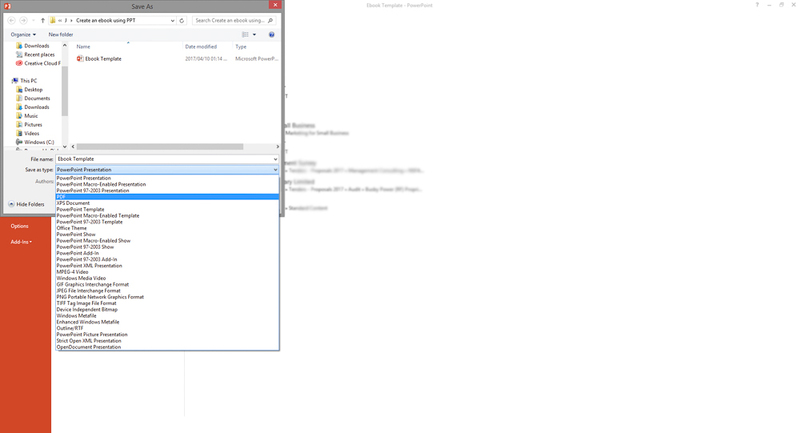 Each tab has a ribbon menu, with its own options that relate to the tab name. We are going to select the ‘Design’ tab. Once you click on the tan, you will see options that relate to the design and layout of your document. On the left, you will have the various themes you can choose from, and to the right of that, you can select the different variants of the theme and colour options to go with that theme. The first thing we are going to do, however, is to set up the page size. 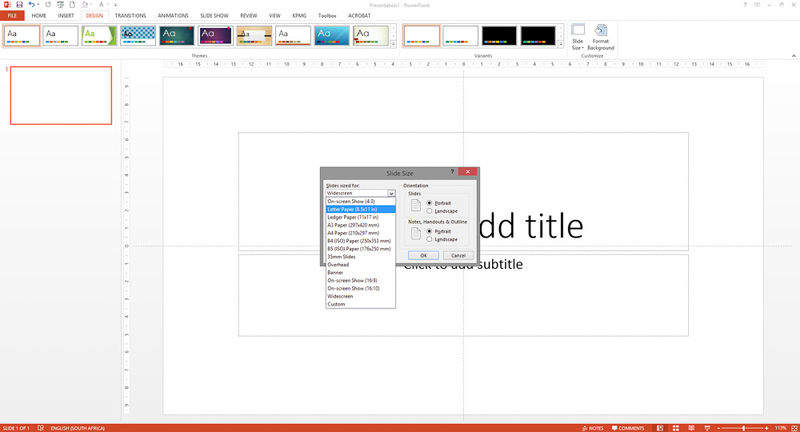 Click on the ‘Slide Size’ drop-down to the right of the ribbon and select ‘Custom Slide Size’. 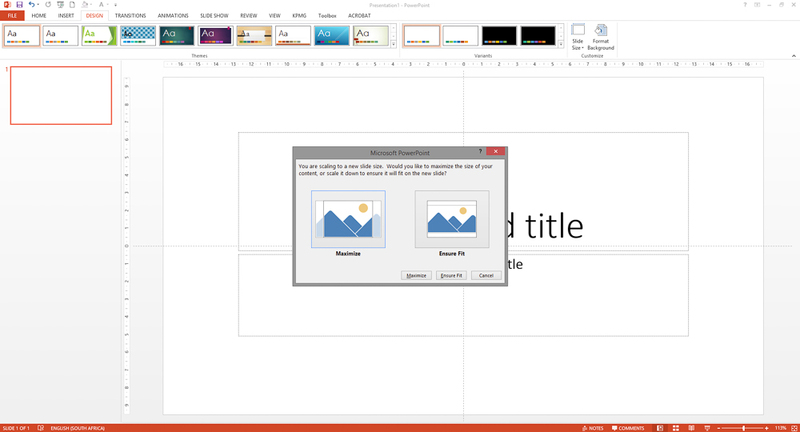 A popup will give you the opportunity to change the slide size, and the orientation. 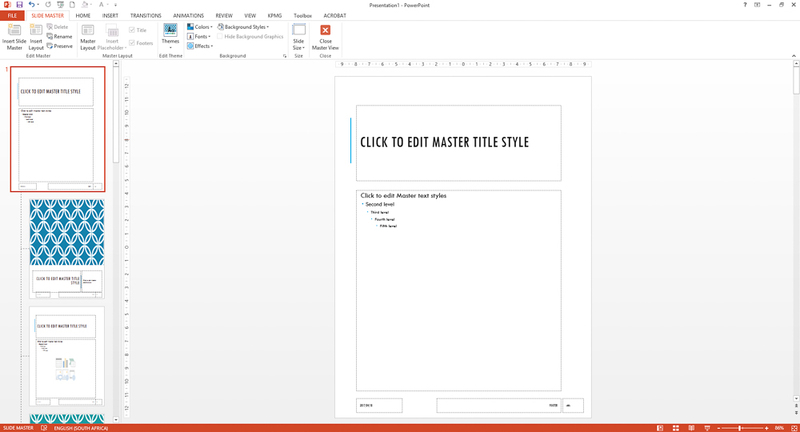 Choose ‘Letter’ from the drop down, and ‘Portrait’ for the orientation. You will see this scaling popup – as you don’t actually have any content yet you can select either option. 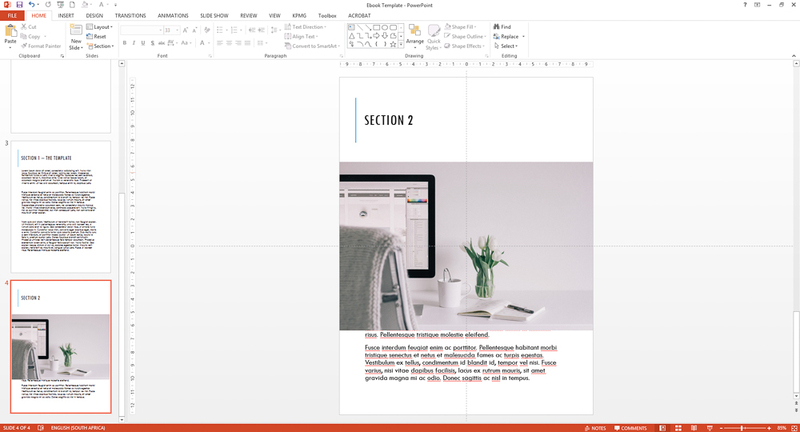 Ok, so now we have the right page setup, we are going to start with the general design of the ebook. You can use a pre-loaded theme and adapt it to your needs. 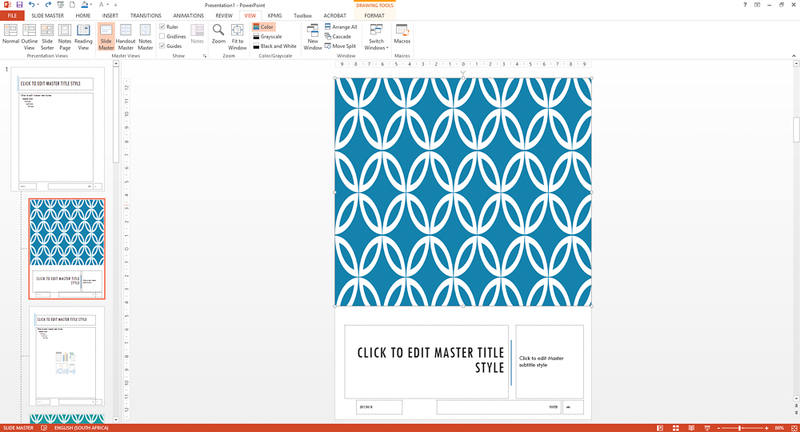 For today’s purposes, we are going to use one of the themes that come with PowerPoint and adapt it slightly. I selected this theme with the fresh, clean cover pattern. You will notice it looks quite stretched out – that is because the design was for a landscape slideshow. But we can fix this easily. Before we do that, I am going to have a look at the different variants offered with this theme and choose the one I like the most. I actually like the original version best, so I will keep it as is. So now I am going to tweak the theme a bit so it works as an ebook. 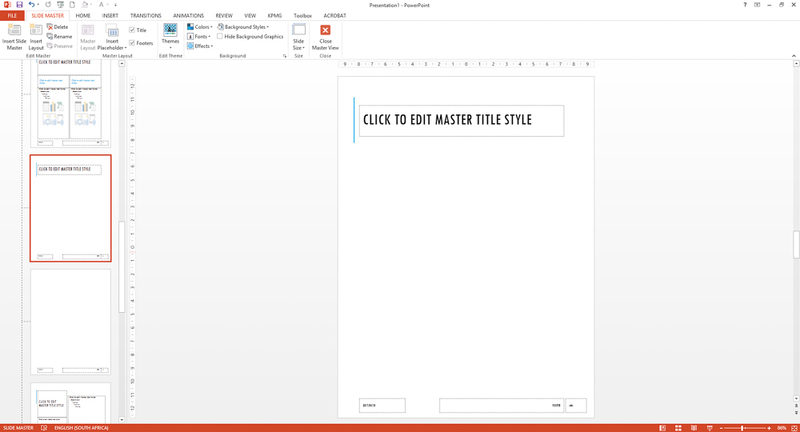 To make ‘global’ changes to your template, you work in the ‘Slide Master’ view. Click on the ‘View’ tab, then select ‘Slide Master’. 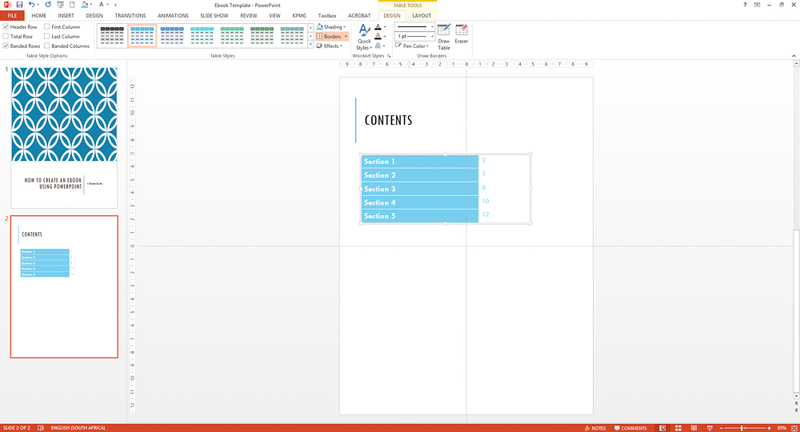 Any changes you make in this view will affect your whole document. Scroll to the top slide – this is the ‘Slide Master’. Changes to this slide will affect the other slides in the ‘Slide Master’ view. 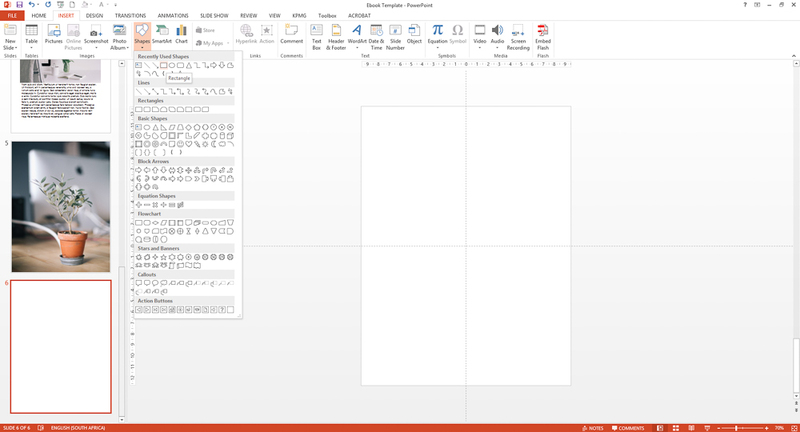 Here I am going to check the spacing and layout, as well as the font and colours. I like the font that is used here, but the space for the heading is too big and there isn’t enough space for the actual content. I have made me heading narrower, moved the blue shape up, and now I will make the content block bigger by dragging the text box higher. 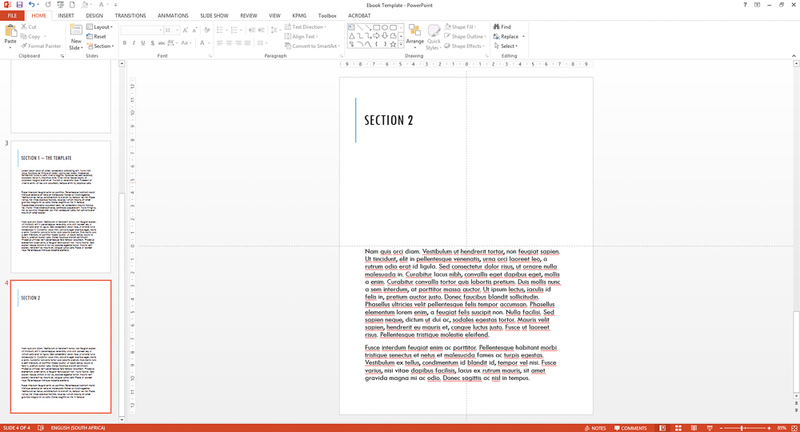 I won’t make the boxes wider, as it is important to have plenty of white space around your text. It will make it easier to read. Now I’m going down to the cover slide, where the pattern got a bit squashed. I click on the pattern and drag it wider until it looks more rounded. You don’t have to do this if you preferred the pattern as is. You can see some of the pattern sticking out on the side – don’t worry about this, once we save as a PDF at the end it won’t be visible. Now I’m going to go back to the ‘Normal’ view by clicking on the ‘View’ tab and selecting ‘Normal’ on the ribbon. Pro tip: I forgot to mention earlier – save regularly! I’m going to save this quickly. Ok, now that we have our template set up, we can start putting in content. 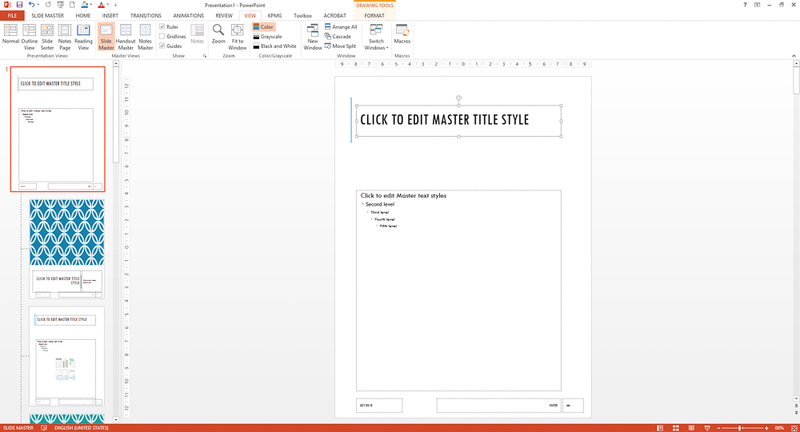 We are going to start with the cover page, which is the page that should be open currently in your document. Now I want to add a contents page. I am going to use ‘Title Only’ slide. I get this by clicking on the ‘Home’ tab, then clicking on the ‘New Slide’ dropdown. 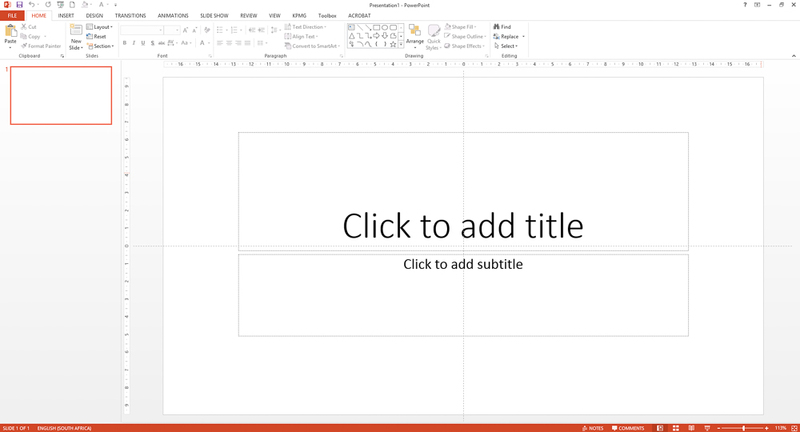 I will select the ‘Title Only’ slide and update the slide title. I then added in a table for my contents. It’s quite simple – I may change it later but for now, it works. 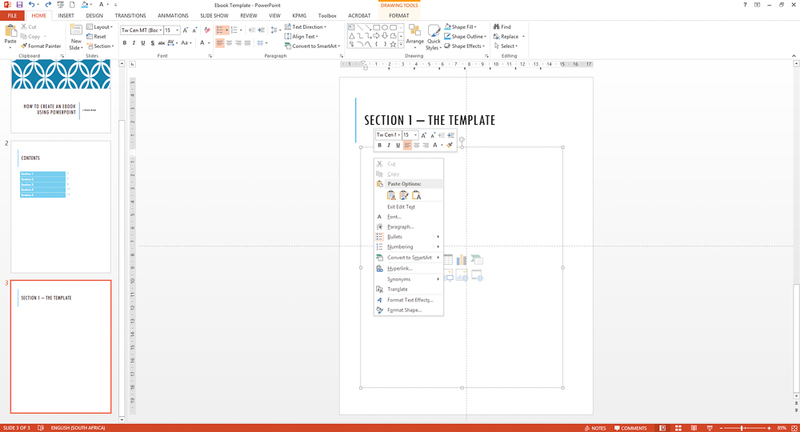 Now I will show you how to insert the pages for the content. 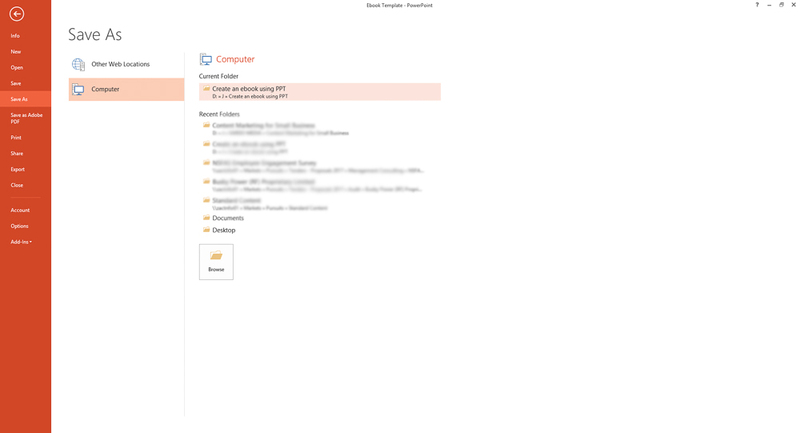 Click on the ‘New Slide’ dropdown again and select ‘Title and Content’. Here you start adding the content you have for your ebook. 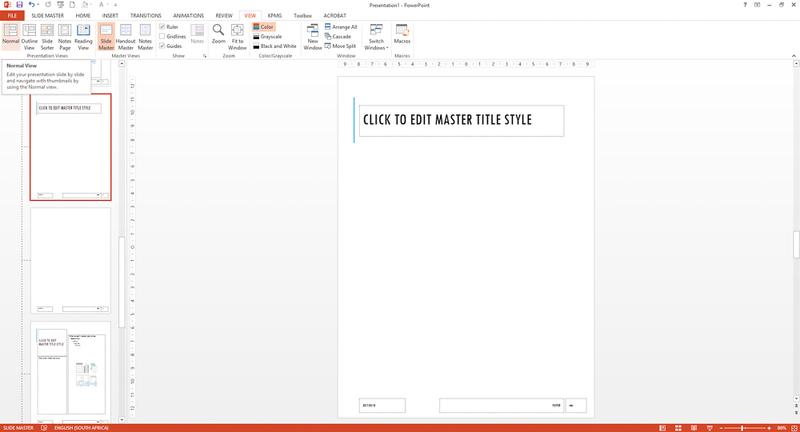 You can copy and paste the text into the text boxes. 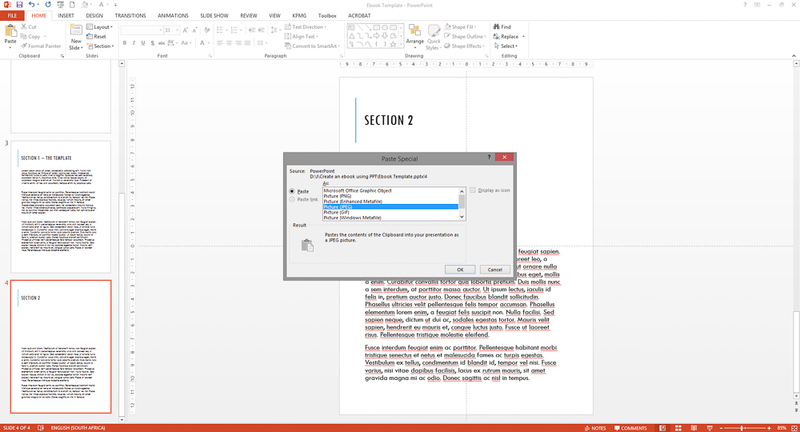 When pasting – click inside your text box, then right-click and select ‘Keep Text Only’. 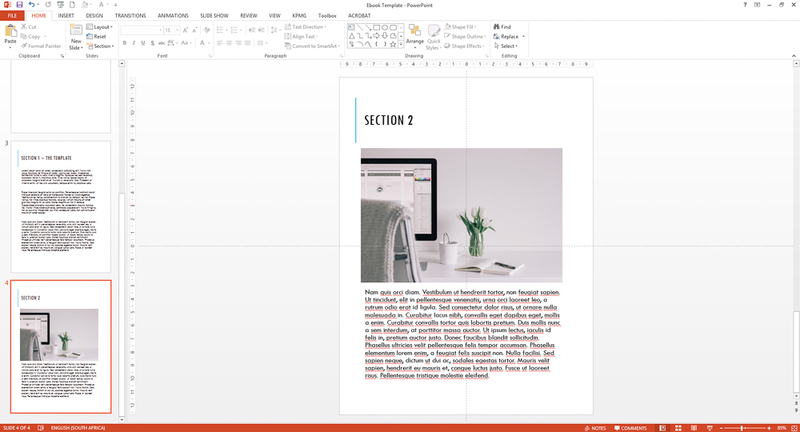 This will ensure that the formatting doesn’t carry over from your Word document (or wherever you are copying the text from), and the formatting will then be consistent throughout your ebook. 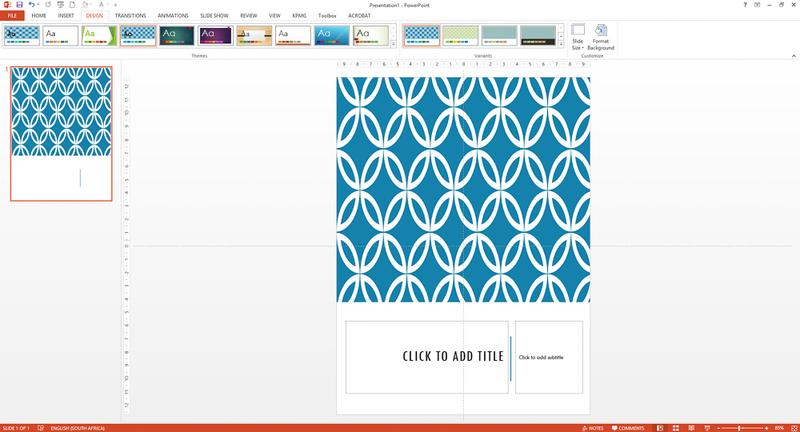 You can include images onto your pages quite easily. 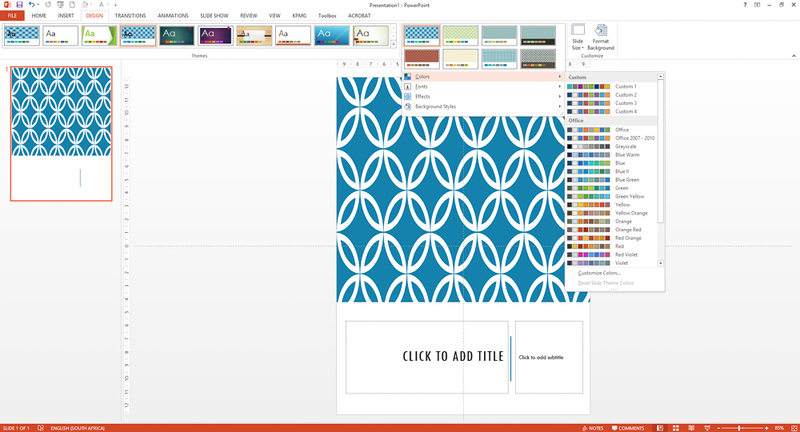 The next page I’m going to create will have an image on top, and the text at the bottom, so I select the ‘Title and Content’ slide again from the ‘New Slide’ dropdown. I have dragged the text box down to about halfway down the page and added the text. 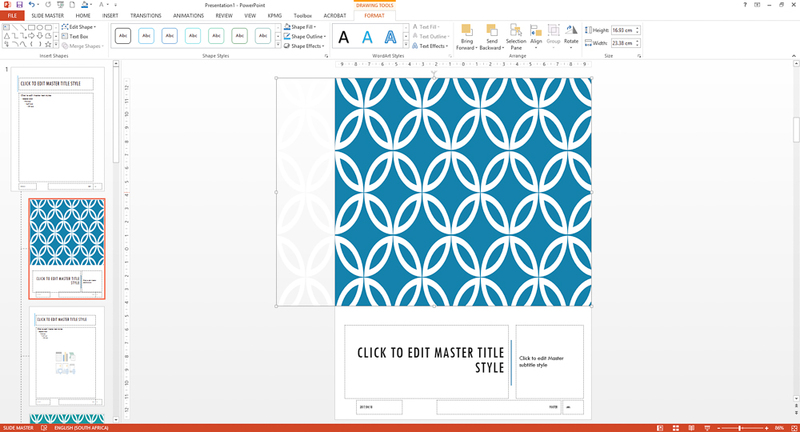 Now you can copy your image and paste it onto the slide. If you are using hi-res images, just adding a few photos will make your ebook a very large file. This trick will keep the quality of your images, but reduce the file size. Under the ‘Home’ tab on the far left, you will see a ‘Paste’ dropdown. Your image will now be 10% the original size (in MB/KB) but have the same quality. Now I just need to move and resize the photo to fit the space (hold the ‘Shift’ button down while resizing to keep the aspect ratio of the photo the same and to avoid a photo that looks squashed or stretched out). In this case, the photo is too high, so I’m going to take some text out and resize the text box. If you need images to use in your ebook and you don’t have the funds to purchase them, there are plenty of stock photography websites that offer their images for free, either with our without attribution. Make sure to read their terms of service carefully though – some sites only allow you to use their photos if you are not making money from your ebook. Carry on adding content to your pages. You can try out different layouts for the pages, but don’t make each one completely different to the next. Choose 2 – 3 layouts and keep to these. 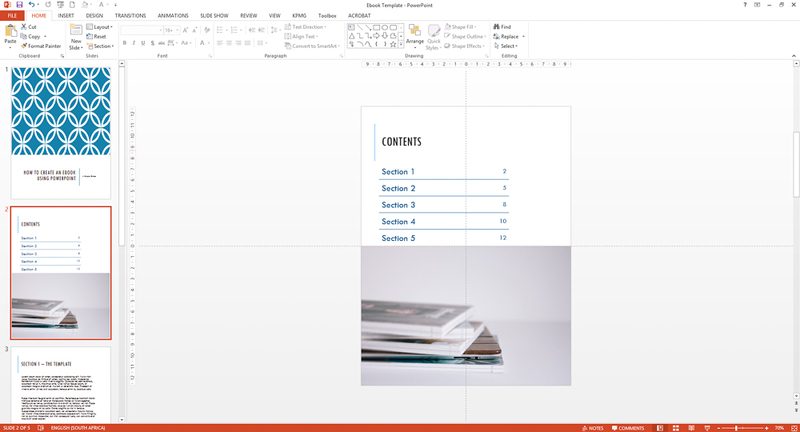 Have a consistent layout provides continuity and will make your ebook easier to read. 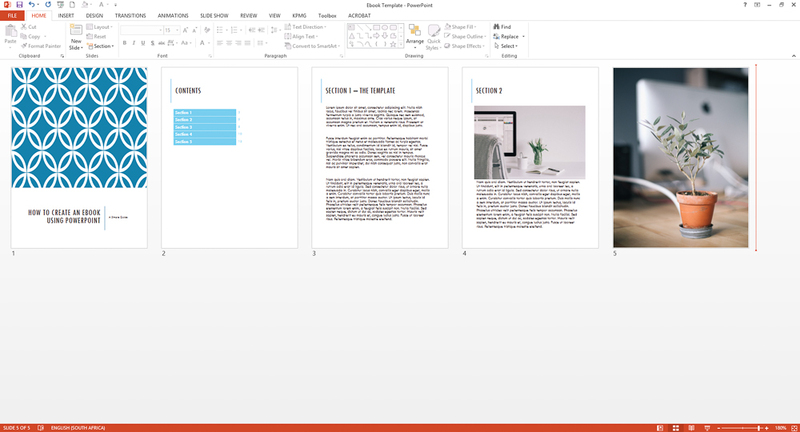 I’ve gone a very simple layout for this ebook. And looking at it now, I know how I want to change the content page. I’m going to change up the colours, and add in an image (the same way I showed you how earlier). Now I’m ready to add the back page. 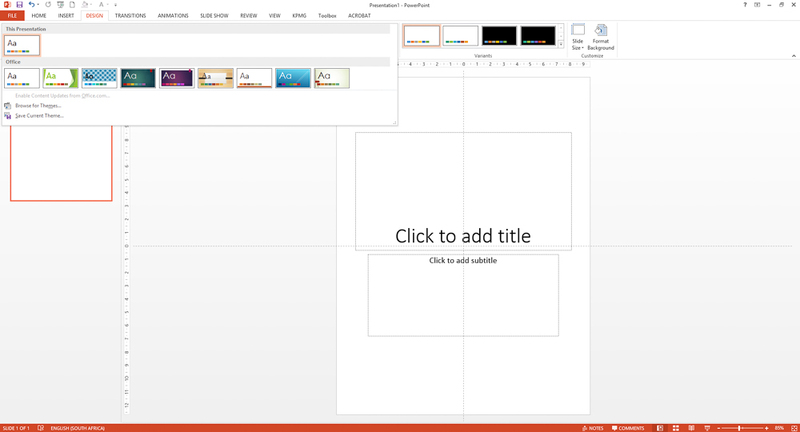 I am going to select the ‘Blank’ slide from the ‘New Slide’ dropdown. I want to make my back page a solid colour. 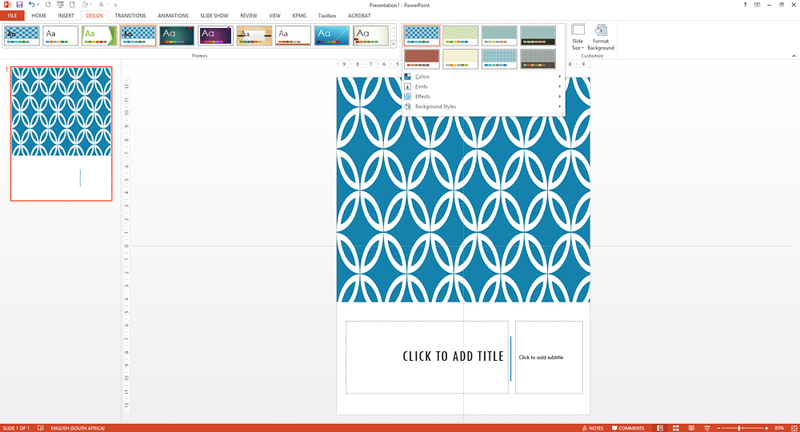 Because I don’t want all the other pages I used the ‘Blank’ slide for to change colour, I am simply going to place a shape onto the page. 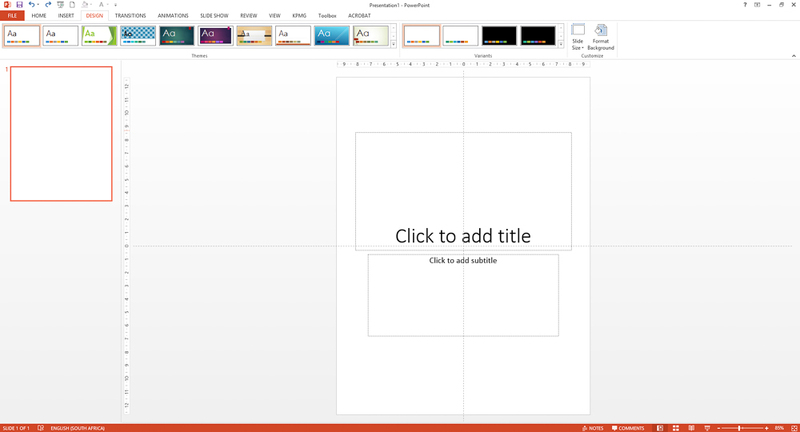 Select the ‘Insert’ tab, click on the ‘Shapes’ dropdown and select the rectangle. 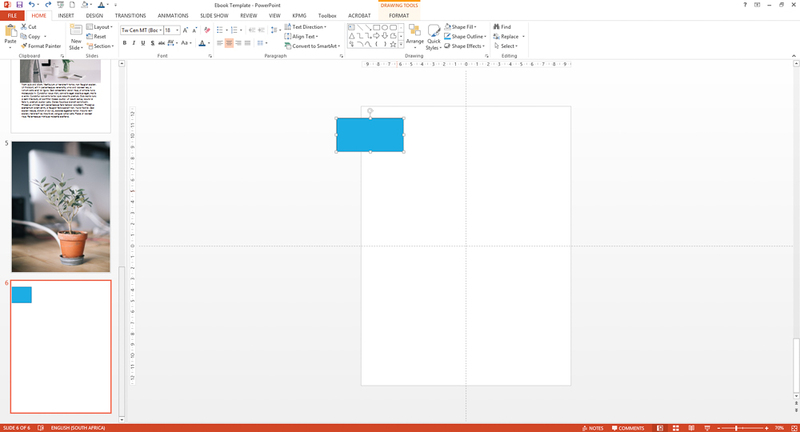 Adjust the shape to fit the page, then fill the shape with your selected colour. 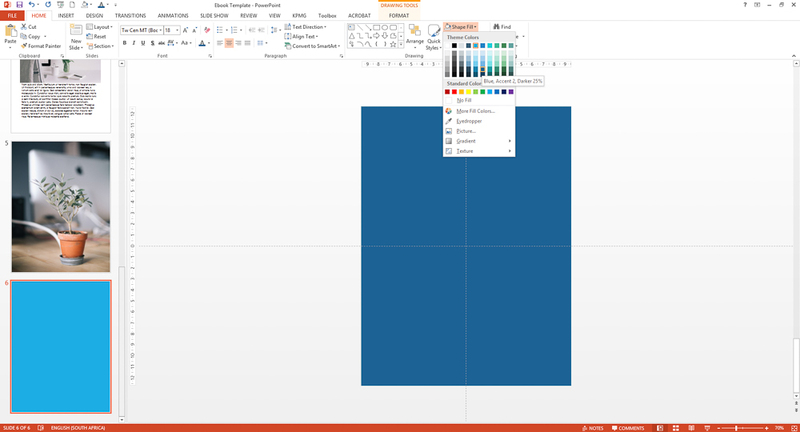 (Make sure to select the shape first, otherwise, the ‘Shape Fill’ dropdown will be greyed out. On this last page, you can include any disclaimer you may have. Insert a blank text box (‘Insert’ tab, ‘Text Box’ button), and paste your disclaimer. You can also include your logo on this last page. As a pre-final step, I always recommend a final spell-check, in case something snuck in there along the way. 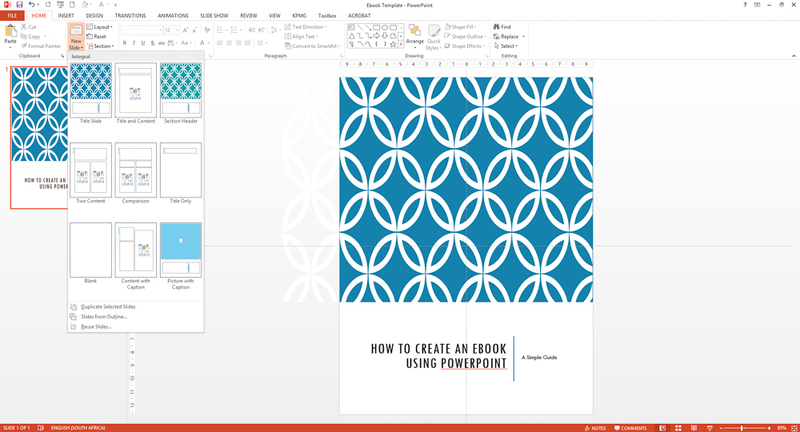 And now, for the final step – saving your ebook as PDF. There are two ways to do this. I will show you my preferred way first. Click ‘File’, then go down to ‘Save As’. Select the folder you want to save your PDF in. The folder’s location will come up. 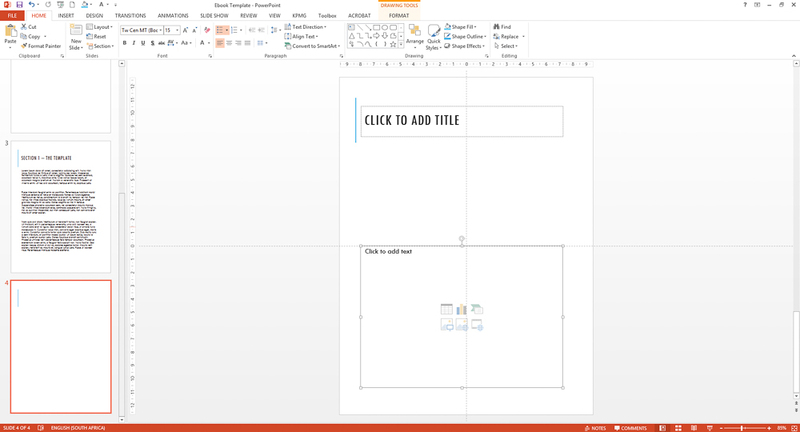 In the drop down at the bottom of the window where it currently says PowerPoint Presentation, click on that and go down to PDF. Click ‘Save’. And there you have it! You have your gorgeous ebook ready to send to your readers! 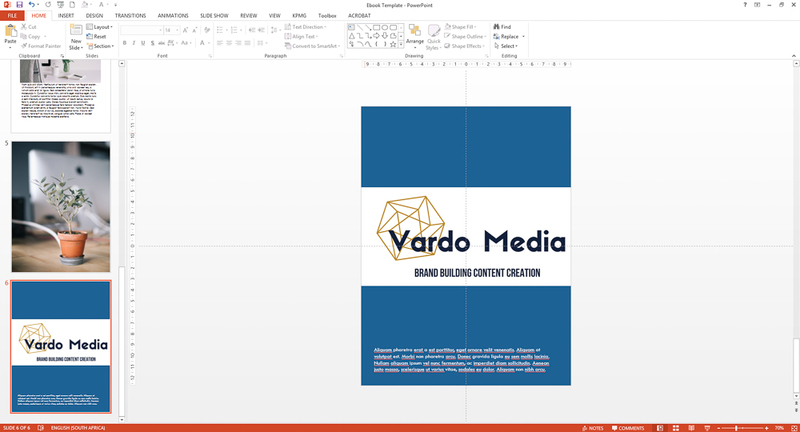 This wonderful post was create by guest blogger Joelle Brisland who is the founder of Vardo Media, a content creation agency that helps build brands through quality content. Great step by step instructions here! Thanks for sharing at Blogger’s Pit Stop. I’ve been wanting to try an e-book for ages and I thank you for such an informative post. Great to have you link up with us at #BloggersPitStop and have a fabulous week.